LAS files can be imported into Voxler using the File | Import command. 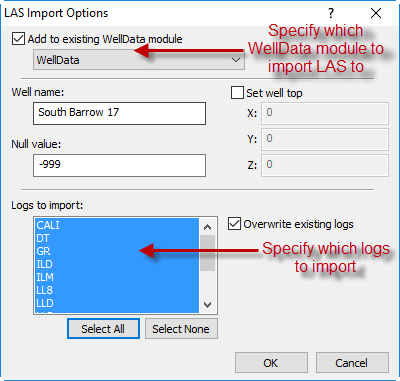 When importing, the LAS Options dialog appears, this is where you can specify which WellData module the LAS files will be added to or if you want to create a new WellData module. Specify which logs within the LAS that will be imported can also be specified in this dialog. Once the LAS has been imported, you will be able to set the log data to specific parameters in the Property Manager.